The highlights were too numerous to mention them all, but a few that made impressions with the attendees were: A powerful keynote from Austin Energy COO Charles Dickerson that set the stage, highlighting the rapid pace of change sweeping across all aspects of the utility sector, and challenging us all to embrace and direct that change and continue to find new and better ways to serve the industry and our customers. A point emphasized in the two days’ discussion was the fact that we are at a critical crossroads in our journey to a more renewables-based and distributed grid. 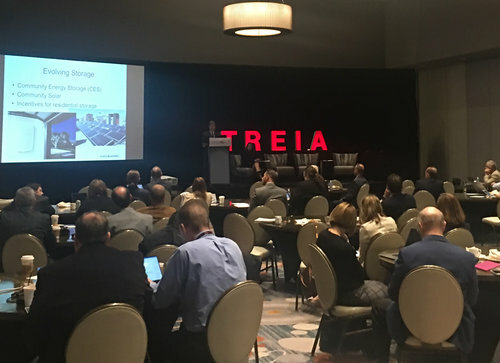 The general consensus among attendees was that we are very likely to see the TREIA vision of 50% renewables achieved by 2030. The critical question that continued to emerge was “how?” Since this industry is often characterized by long-term investments, the decisions taken today have implications that endure for decades. Utility representatives atGridNEXT placed increasing emphasis on the need to avoid large and costly mistakes in the planning and resource investment process, as the landscape on both sides of the meter continues to change. Accelerated retirement of conventional generation, combined with increasingly cost-effective renewables and an evolving role of customers all create significant levels of uncertainty. This requires a new approach involving a far more flexible and adaptive planning process, involving smaller resource commitments with shorter lead times, what CPS Energy referred to as a ‘flexible path’ approach. A number of panels focused on the need to grow our system resilience, and addressed the challenge through various lenses. These included a planning perspective – how to make our grids and our cities more resilient as natural stressors increase - as well as the types of resources that can be brought to bear. Energy storage, in particular, was singled out as a newly emerging asset with great potential, but only if the regulatory community appropriately recognizes its value. Many panelists also commented on the growing level of involvement from actors formerly not involved in the conversation. These include corporate buyers of renewable projects, who increasingly care where their renewables come from and how they are developed. These actors also include homebuilders and developers seeking to build more sustainable living environments, both in cities and the suburban landscape. At the same time, there is also a small portion of the populace that looks skeptically upon renewables developments, especially at the utility scale. A growing challenge will be to proactively engage in more education and interaction well prior to physical project development, so that we can bring the general public along with us on this mission to grow a more sustainable economy. Finally, while we already deploy numerous sustainable solutions, there is a continuous need to increase the size of the toolbox. Society will continue to benefit if we nurture the communities of technologists and innovators that develop and bring new solutions to the rapidly growing market. GridNEXT 2018 ended amidst a high level of enthusiasm. However, before we shut the door on GridNEXT 2018 for good, the board met to discuss the highlights, and develop a strategy for 2019. That plan is already moving forward, with much enthusiasm among the board. We thank you all for your wonderful contributions to the dialogue and hope you join us again as we move GridNEXT 2019 to San Antonio this coming year!